The National Pest Management Association’s member pest control companies have reported 50 times more bed bug calls than usual in the past two years. A survey of pest control operations conducted by an entomologist at the University of Massachusetts found that 68% of all bed bug infestations require three or more treatments using traditional methods. Inspection: Our Technician starts with a thorough inspection of the room to identify all breeding areas. We then offer two highly effective treatment methods that will eradicate your bed bug infestation. 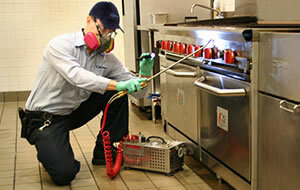 A “state of the art” flushing method will reach the deepest cracks and crevices where bed bugs breed. We then apply long lasting liquid and powder residual products to ensure continuous protection against bed bugs and their eggs. For treatment of more severe bed bug infestations, we recommend adding our specially designed ThermO high-output Heat Remediation system developed exclusively for use in Hotels and Apartments. Inside the infested rooms, a temperature of 140 degrees is reached and maintained for a period of approximately 5 hours. This not only kills all the stages of the bed bug life-cycle…from eggs to adult…but also ensures the optimal killing temperature is reached deep in the wall voids, cracks, and crevices where penetration is not achievable with surface treatments. Thermo probes are strategically placed throughout the room to ensure the target temperature is reached.